Jeff's Bike Blog: So why don't pedestrians get bagged for doing dumb things on the road? So why don't pedestrians get bagged for doing dumb things on the road? I had a bit of an epiphany the other day as I was commuting through the CBD on my bike. If I catch the first set of lights past the train station I can often make it all the way to Manners Mall before there is a red light. It seems like the lights might be phased for about a 30kmh average, if that's the way it works. The only other impediments to my progress are the pedestrians trying to nip across the road without looking. Some pedestrians remind me a lot of the sheep I used to come across when I was learning to ride my motorbike in the country as a teenager. 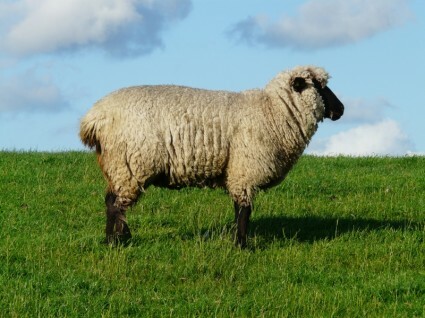 When I saw a sheep on the side of the road, a chill went down my spine. The sheep might let you pass no problems, or it might do a 90 degrees pivot turn and spear across your path, taking out your front wheel, dumping you on the road and filling your school shorts with gravel. All of the accidents I had in my formative years were as a result of wandering stock on the road. Sheep, cows, even dogs. It taught me to expect the unexpected, and somehow I managed to make it through the next 17 years of motorcycling with no real accidents to speak of. Now most pedestrians are not that bad, but with the "rogue" ones, there is a part of their behaviour that can appear as random as a sheep's, and there is often a bit of a herd psychology going on when one has a crack at a marginal road-crossing move and another one quickly follows because everyone knows there is safety in numbers. Why don't people standing around the "water-cooler", and in the Stuff "comments" bleat about the "Bloody pedestrians" as well as the "Bloody cyclists" ? Most car drivers have walked at some stage in their lives. They can relate to pedestrians. It's likely that some of them may have even walked on that very day that were bleating about the stupid cyclist who jumped the lights. (Yes, it annoys me too). Maybe they even walked through the CBD at 5:15 pm when I am passing through and they are trying to sprint diagonally across the road on a 90 degree corner that they cant actually see around, protected only by the imaginary force-field emitted by the cell-phone pressed hard against their heads. When you can relate to someone or something you are willing to cut them some slack. What is the answer to this predicament? Get the car drivers on bikes. Grow them some empathy. Hmmm. There must be a downside right? I haven't thought of one yet. Maybe some drivers will decide they like cycling and make the roads a less crowded place? 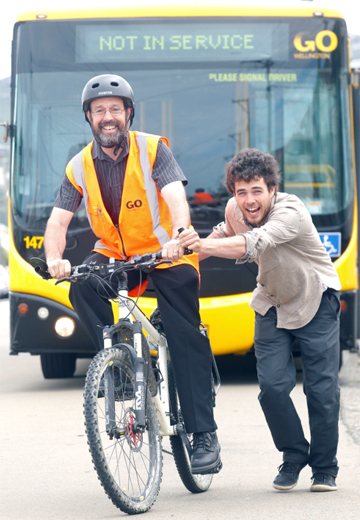 The Greater Wellington Regional Council must have known about this empathy thing as they have been getting bus-drivers and cyclists to swap seats for a few hours to spend some time in the other guys shoes. Follow the link, but don't look at the comments. Stuff comments are written by the same people who scratch messages on toilet cubicle walls. The other campaign we are seeing that humanises cyclists with pictures on the backs of buses, with labels on their shirts like: Father, Sister, Uncle, Son is also a move to create empathy. I actually think something is working. The amount of times that I notice a car cautiously driving behind me, waiting for a safer opportunity to pass is on the increase from even 5 years ago. 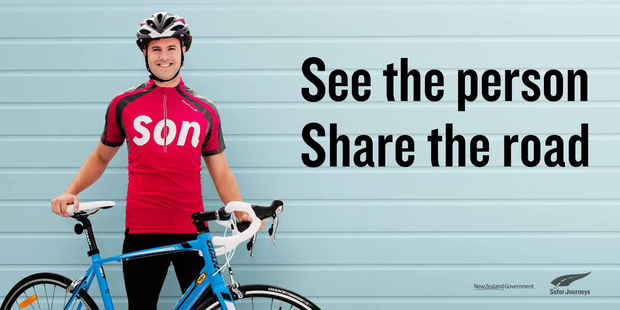 But if you are a cyclist, running the lights and hoping for the "Herd immunity" offered by other people doing the right thing, then you should think about this ad too. "Other people make mistakes". 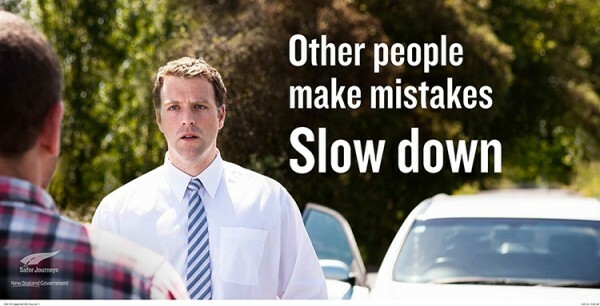 Potentially 50% of the people in any accident are without blame. You don't wont to think about what happens when both party's are ignoring the rules. Disclaimer. No pedestrians were harmed (permanently) in the writing of this blog-post. I have been known to pedistrate myself. Some of my best friends are pedestrians, even though I don't think any of them are paying road user charges for walking on our roads. Well put, it's like a game of tag and we are always 'it'! We did a drop of thanks of biscuits up around Te Horo (where we race regularly and a lot of people bike). The response was fantastic from the residents and you could feel the difference. We're about to do another drop of thanks to the residents in Reikorangi - where there has been issues between bikes and motorists in the past. We had one person who got in touch and said that after getting the cyclist baked biscuits and the message of thanks that went with it - they had completely changed their attitude towards cyclists.... That's a big win! Bouyed by that success we also started the Note of Thanks initiative where we send a postcard of thanks to companies for specific acts of courtesy.. Just started that one - but it's going well.